Once authorised you will be taken back to Sync2CRM, scroll down to the connection you have just added and you will see the message explaining the account does not have an API key. Click the “click here” link and you will see a pop-up asking for your API key. On the next page, if you scroll down you will see the “API” section. You will need to type in a pass phrase and click “Save” When the page reloads you will see that now, you have an encryption key. You will need to copy and paste this into the Sync2CRM popup which asked us for the API key and click “Validate & Save”. 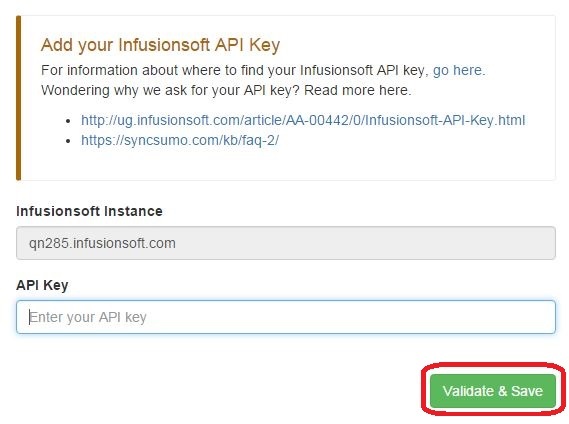 Once you have clicked Validate & Save, you will see the message is no longer there and your API key has been accepted. 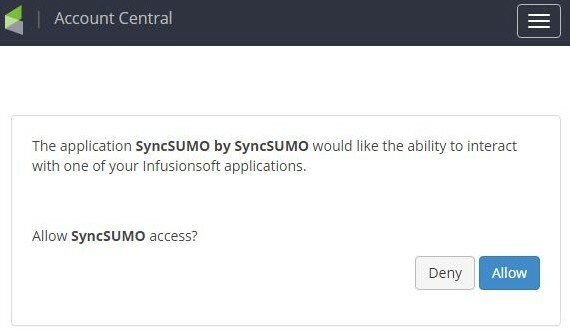 Your Infusionsoft account is now connected with Sync2CRM!